Stream of consciousness filmmaking is closely linked to the written counterpart, but because words are intellectual this form of writing is literate, whereas in cinema it feels more like memory. Moving images have an instant validity, and when a story is not linear, when it depends on the mind of a teenage kid with a lot of time on his hands, the work is experimental and involves us despite the disjointed, often fractured and confusing storytelling. Gus Van Sant’s Paranoid Park is a great and rare example. Other examples in contemporary American cinema are some of Van Sant’s other recent works. He is proving himself a remarkable talent, one that even his early successes could not have hinted at. Paranoid Park is about an incident and characters that live it, but there is no storyline. Alex is a skateboarding kid. 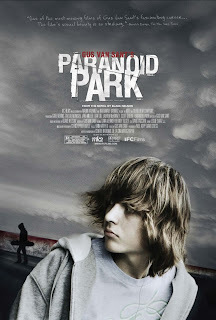 He hangs around with his best friend Jared who convinces him to go to a place that Alex admits he is not ready for: Paranoid Park, a grungy skate park in Portland. One night when Jared goes away, Alex goes to the park, meets some older guys, runs away with one of them via spontaneous freight train, and an incident occurs. This is linear progression, but Paranoid Park exists in Alex’s writing. He’s constantly writing in what I at first thought was an extended journal. Only at the end of the film did I understand that Alex is writing over the course of one night, and the majority of the film’s final scenes actually take place—chronologically—somewhere in the middle of the film’s short 84 minute running time. We often see the same scenes repeated. The shots of Alex in either his uncle or his mother’s house show him entering his bedroom from a room where we had seen him previously write. I believe every time we see this same setup we are seeing the exact same moment in this character’s life. Why would Van Sant construct his film like this? He does a similar thing in Elephant, but there because of the structure of the film we were seeing several different stories taking place congruently. Here we have one perspective, Alex’s, and the conceit doesn’t seem like it could fit but it works remarkably well. Well, why does it, and why do we see these repetitive moments? This is not a question to be asked but merely a fact we must accept. I personally found the challenge of deciphering this movie a welcomed change of pace from most films that predictably proceed in a linear fashion. I often wonder why films need to tell a story. It takes a skilled hand to render 90 minutes or so of screen time without a clearly defined story, characters and conflict, but often times the results of these experiments is quite fascinating. They are not slice of life films, a term I despise because of the connotations the phrase conjures. Rather they are experiences, impressions of life, and Van Sant’s treatment here creates an impression of a character. I often say that this is the ultimate reach of the cinema, to create impressions. A movie is a work of art, not life, and often times, films of this kind contain a hyper-reality that gives us, the audience sitting in our seats looking at a 2-dimensional flat screen, a sense of how the director uses reality to create his vision. The film, however, though essentially about a death, is not a mystery nor is it suspenseful. Van Sant doesn’t show us the character most duplicitous in the crime or event as receiving punishment. He suggests it is coming and indeed creates a great deal of fear and paranoia and the utter indifference one so young, of a sort or type typical in youth culture for the past decades, but the film is never “about” the crime. It is about a kid dealing with the fact that he, directly or indirectly, is responsible and now has to deal with it. The film, however, is more definitive than I am suggesting, but because the narrative material is comparatively slight I will remain vague so as to not spoil for you the mood and anticipation I certainly got watching it. One thing I greatly appreciated was Van Sant’s use of aspect ratio. Most films are in a wide-screen format, some 1.85:1 or even worse they’re in scope, something narrower like 2.35:1. This basically means the screen is rectangular. I don’t like looking at movies this way. In a sense the aspect ratio renders everything as a landscape, at least in terms of framing a painting; there’s either portrait or landscape. The landscape composition is meant to show beauty, and in cinema I find a square ratio, 1.37:1, is more fitting in capturing reality. It cuts off our peripheral vision and focuses in on what the director wants. I love Gus Van Sant’s modern, experimental work. I love that it’s done by an American filmmaker. It shows us that American cinema isn’t dead yet. Paranoid Park is intelligent, thought-provoking movie making, about characters of a certain age, and still refreshingly original.